Subaru STI Performance Parts have been created in close co-operation with the development team of Subaru Tecnica International (STI). 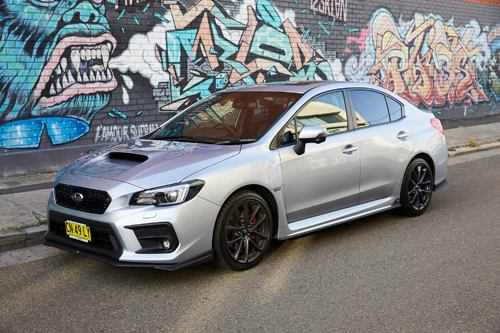 Engineered specifically to enhance the performance, endurance and/or appearance of your Subaru, Genuine STI Performance Parts allow you to customise your vehicle without compromising its quality and integrity. Genuine Subaru STI Performance Parts are manufactured and designed for road use only and carry the same manufacturer's warranty as all other genuine Subaru Parts and Accessories. Where Can You Buy Genuine Subaru STI Performance Parts? We have Australia’s widest range of STI Performance Parts and an Australia-wide Dealer network. Meaning that you can access the STI performance parts you want when you want them. Engineered specifically to enhance the performance, endurance and/or appearance of your Subaru, they allow you to customise your car without compromising its quality and integrity. You can pick up Genuine STI Performance Parts from your local participating Subaru Retailer. They can also organise to have your STI Performance Parts fitted by a Subaru factory-trained technician. Do you live for performance? Know someone obsessed with Subaru STI? Our Subaru STI range of merchandise includes t-shirts, polo shirts, jackets, headwear, keyrings, pens, lanyards, stickers and more. Check it out at our online shop today. Purchase your Subaru STI gear from the online Subaru Shop now, or visit one of our Subaru Retailers. Subaru has a rich history in the world of motorsport. Globally, the Subaru World Rally Team won a staggering 41 events in the World Rally Championship between 1993 and 2003. Locally the Subaru do Motorsport team competes in the Australian Rally Championship (ARC). In 2016, our driver Molly Taylor became the first female to win the ARC in 25 years! Read the latest news here. Our friends over at Subaru America also like to chase records, producing WRX STI Time Attack. A custom built, one of a kind car engineered in partnership with Prodrive, a British based motorsport and advanced engineering group. When you have them fitted at the time you purchased your new vehicle (or at your first scheduled service by your Subaru Retailer), you get a three-year/unlimited-kilometre warranty. When you purchase Subaru STI Performance Parts and have them fitted by your Subaru Retailer at any other time you get a two-year/unlimited-kilometre warranty. Subaru STI Performance Parts purchased and installed independently or by a third party are warranted for 12 months from the date of purchase.